Actually, you might be shy a few parts too. 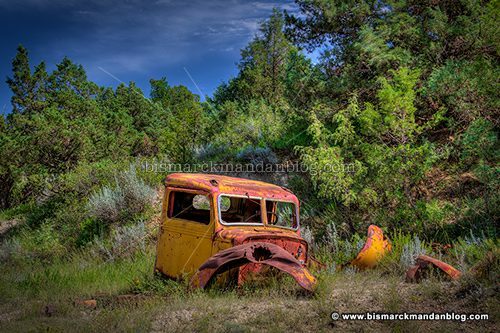 This truck cab and fenders are nestled into a hillside along the river, where they enjoy a fantastic view for their retirement. No sign of the rest of it. I bet it was pretty fancy in the day – that yellow is still brilliant after what appears to be a decades-long abandonment! This entry was posted in Vehicles by Clint. Bookmark the permalink.